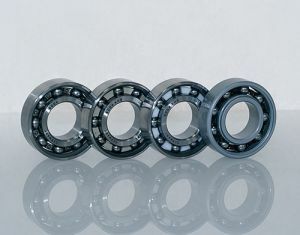 Single-row IBC 40° angular contact ball bearings are available in the 70, 72 and 73 series and are suitable for high external loads due to their internal geometry. Axial forces, which can only be accommodated in one direction pressure the rolling elements between the high shoulders of the inner and outer rings when under load. Due to the contact angle, the radial forces likewise cause an axial force that must be taken into consideration in the design. Single-row full complement cylindrical roller bearings are manufactured in NCF and NJG designs. Full complement cylindrical roller bearings are not sealed and are not lubricated with grease at the factory. Oil or grease lubrication can be applied via the front side during installation or during operation. 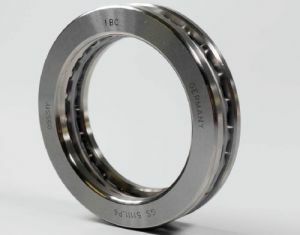 Cylindrical roller bearings of the series NCF have an inner ring with two fixed flanges and an outer ring with a fixed flange that can axially guide the shaft in one direction. The -cylindrical roller bearings series is exceptional due to its Extended Capacity and Advanced Application features. Optimization of the design, materials and production processes has resulted in a significant improvement in the lifetime and working life, functional safety, durability and running properties while at the same time reducing friction and heat generation. Furthermore, the products are characterised by higher dynamic load ratings. 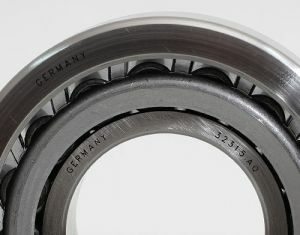 Depending on the application, different bearing designs can be selected. Thus it is always necessary to take into consideration a number of different influencing factors such as the temperature, lubrication, speed, load-bearing capacity, moisture, vibration, installation geometry, maintenance, etc. Special bearings are used to meet exceptional requirements, making them especially suitable for certain bearing applications. Only high-performance and reliable rolling bearings with a long service life are able to ensure the functionality and operating reliability of these machines, systems and units, guaranteeing that they can operate trouble-free over long periods. 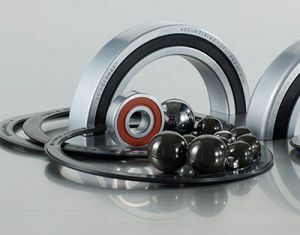 Single-row IBC deep groove ball bearings can be used in a wide variety of ways. They are simple in structure and are suitable for high speeds due to their low frictional torque and are insensitive in operation and maintenance. Deep groove ball bearings are the most commonly used type of bearing due to their ability to take radial as well as limited and axial. 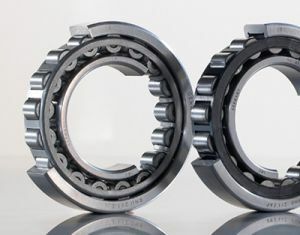 Deep groove ball bearings are manufactured by IBC in various forms, with various cross-sections in many variations to suit the respective application. Spherical roller bearings are used if the bearings are required to withstand the heaviest loads. They have barrel-shaped rollers as rolling elements that are arranged in two rows next to one another. The inner ring has two separate raceways. Since both sets of rollers run in a common spherical outer ring raceway, shaft deflections and any misalignment of the bearing seats are compensated for. Self-aligning ball bearings are double-row, self-retaining design with spherical outer ring raceways. 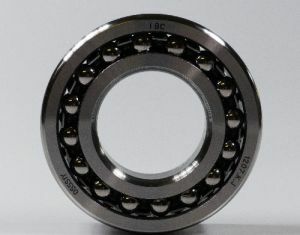 The inner ring has two raceways that are similar to those of deep groove ball bearings. Self-aligning ball bearings can therefore be adjusted for angle and can compensate for any misalignment. They are designed for medium to high speeds and can accept small and medium axial loadings in both directions. Since they are produced with a cylindrical or tapered bore, they can be mounted to the shaft using adapter sleeves. 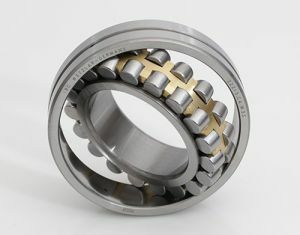 The shape of the rolling elements of tapered roller bearings resembles a truncated cone. At the large cone diameter the inner ring has a high, specially shaped flange that must also transfer a proportion of the axial forces. Together with the cage, the retaining flange at the small cone diameter prevents the rollers from falling out. The outer ring has no flange and is therefore easily removable for installation. 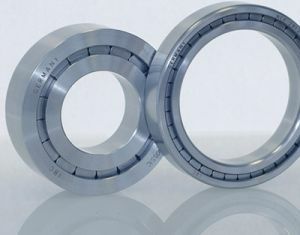 Single direction axial thrust bearings consist of two disks, a housing and a shaft disk with raceways and a cage to guide and retain the balls. They can only accept axial forces in one direction. No radial loading is permitted. They can be dismantled, allowing separate installation of the cage and the shaft and housing disks. As the balls try to run out of the raceways higher speeds and lower loads due centrifugal force, a minimum axial loading is required.